With an installed base numbering in the tens of thousands and with many Beck electric actuators operating in punishing environments for years on end, overhaul and refurbishment services are offered to extend service life and return equipment to like-new condition and performance. 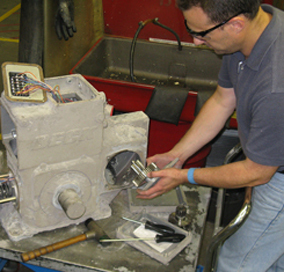 To meet this need, Beck offers complete repair and refurbishment services for our electric actuators, as well as individual actuator components such as motors and electronic circuit board assemblies. Repaired actuators and components are warranted for 12 months, with all replacement parts covered under Beck’s industry leading 3 year warranty. A thorough inspection is performed on each returned electric actuator or component and a detailed report and cost estimate is provided prior to commencement of work. If repair is not economical and a replacement is ordered, all inspection fees will be waived.